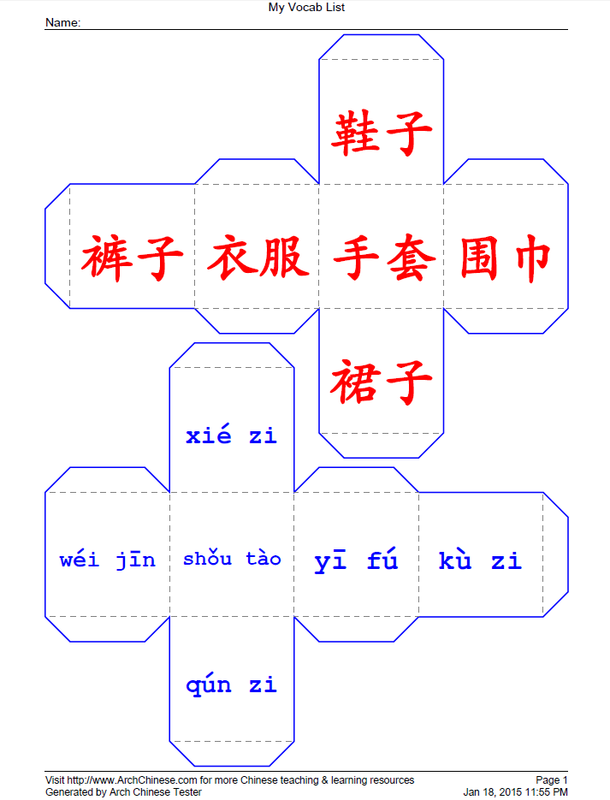 The Printable Dice Maker allows parents and Chinese teachers to create paper dices with Chinese characters or words, Pinyin or Bopomofo and English definitions of the Chinese characters and words. Dices with pictures will be added soon. You can cut out along the edges and fold along the dash lines and form into a cube shape. After gluing the flaps and secure them in place, you can attach a string to hang the cube or play the dice game in the classroom with your students or at home with your child. 3. 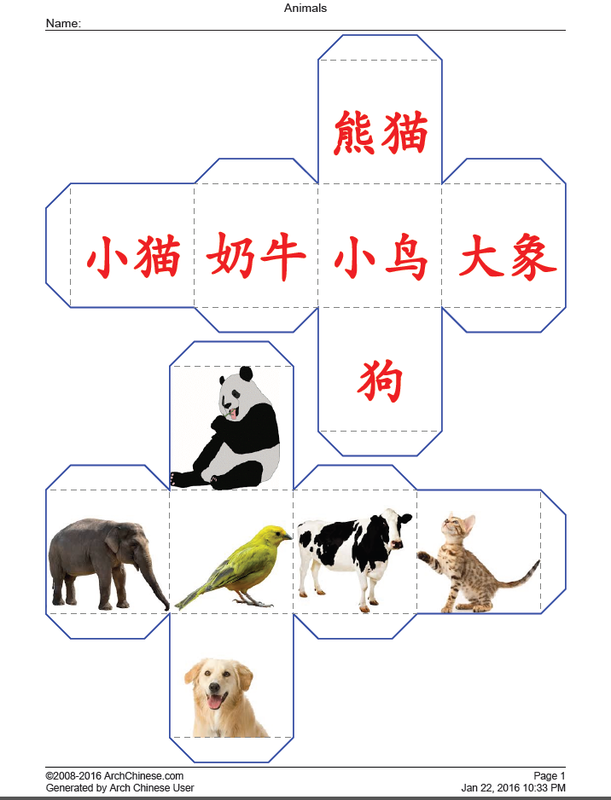 Print picture dice along with the Chinese dice (note the user needs to add pictures to the words). Enter the title of the dice sheet, such as My Family. The title will be shown at the top of the generated worksheets. It is also used to identify the word list and it is required to save the list to the server. Enter the Chinese character or word. You can copy or paste Chinese text from other sources, such as web pages or word documents, or enter them using your faovorite Chinese Input Method Editor(IME). Both simplified and traditional Chinese characters are supported. Enter the definition of the Chinese character or word in English (or your native language). If it is a single Chinese character or commonly-used Chinese word, you can click the E button to let the system fill in the English definition. Click the P button to add Pinyin automatically. In the case that there are multiple pronunciations for a particular character, the system will attempt to use the right one based on its context. In some cases, the user may have to edit it. Do not use punctuation marks in the Pinyin input box. Note that Pinyin must be entered with tone numbers. The system will convert them to tone marks or Bopomofo when the worksheet PDF is generated. In addition, the Pinyin syllables must be separated by a blank space. As an example, for the Chinese phrase 你去哪儿？, the Pinyin must be entered as ni3 qu4 na3 er2. Use v for ü, for example lv3 for lǚ, and number 5 for the neutral tone, e.g. ma5 (吗). Click the image button to upload or search an image for the Chinese word. Select the Clear Image menu to remove the image from the word. Optionally, change the default worksheet settings. The settings are self-explanatory. Click the color buttons to bring up the color pickers for Chinese, Pinyin and English text. If you want to generate picture dices, make sure the Print picture dice along with the Chinese dice option is checked and you have selected or uploaded pictures for the words. Click the Print button to generate the printable.